Overweight? Join the club. About 55% of the American population is overweight or obese. It is a product of a culture successful in providing the basics (and more) of life. Popular culture is obsessed with excess, success, and appearance, especially weight. But in a more real context, overweight is not a matter of cultural success or vanity, it is a health risk. It has absolutely all of the qualities of a disease. If you had an infection, you would treat it -- you would feel better and avoid worse problems that might occur if the infection got out of hand. The treatment of excess body weight does not have a simple solution like an antibiotic pill, but it is no less an illness, and also requires successful therapy to avoid long term consequences. It is a chronic illness (and not a popular one!) that has long -term consequences and requires long-term solutions. It can have a very satisfactory outcome. What are the health risks of overweight? But it's so frustrating to try and lose all that weight . . . I'll never succeed! But aren't there some medical causes of being overweight? Okay, I'm overweight and I'm motivated . . . what do I do now? I wish it were easier. Do I always have to think about what I eat? Are there some other "Tips and Tricks" that can help? What programs are there that could help with this? What about diet pills, vitamins, and other pills? Don't forget to use our "Weight Loss Action Plan" to help begin your program. One in every 3 Americans has a substantial problem with their weight: that is, a body weight 20% or more above recommended. Morbid obesity (more than 100% above normal) involves 3% of the population. Obesity and its associated problems is estimated to cost $68 billion each year. 1 in 3 Americans are dieting at any one time -- only 1 in 20 will attain their desired weight. Arthritis, particularly of the hips and knees (they've got to support that weight). High blood pressure (many people could be on far fewer or no medications for their blood pressure if they lost weight). High cholesterol (not all high cholesterol is caused by being overweight. In fact, much of our cholesterol level is determined by the genes we inherited from our parents. Nevertheless, weight gain can cause these already somewhat faulty genes to be overtaxed. Cholesterol levels may often return to normal with restoration of ideal body weight). Diabetes is 6 times more frequent. We have not touched on the social problems in this regard. Measures of psychological and social satisfaction are clearly lower in the overweight. Very few conditions can cause as many problems! Let's look at a graph of longevity according to a person's body weight. Very skinny people, many of whom may be malnourished or debilitated, have a higher mortality than those of normal weight. After accounting for these few, there is a graded worsening of the mortality rates as weight goes up. These are the same sorts of graphs we could draw for cholesterol levels or blood pressure. As noted, over 50% of people are. The definition of overweight is derived by looking at studies showing the relationship of weight to the occurrence of death or medical problems. In this analysis, "overweight" is not a subjective decision. 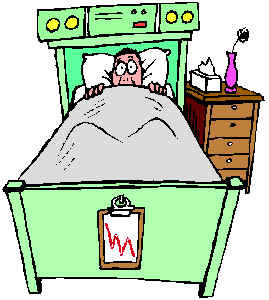 It is present when a health problem is shown to occur at a given level of weight. It is important to note however that one need not attain "ideal body weight" to achieve successful weight loss. Losing some weight confers definite health advantages to many and may be a success! Desirable weight depends on a person's height. 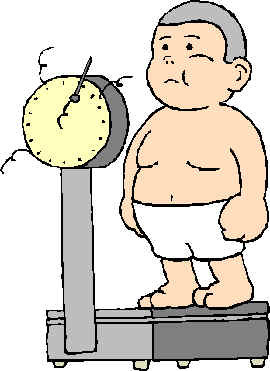 A useful tool which corrects for a person's height is the "Body Mass Index", or "BMI". BMI = (Weight in kilograms) / (Height in meters squared). The non-metric formula is BMI = [(weight in pounds) / (height in inches squared)] x 703. Other measurements of importance are waist circumference and waist:hip ratio. Males with waist circumference of greater than 40 inches or women with greater than 35 inches are at risk. Men tend to carry their extra pounds in the abdominal area, and women in their hip areas. The male pattern of obesity (which can be visualized as an "apple") is a higher risk than the female pattern (visualized as a "pear"). For the same waist circumference, the amount of weight carried within the abdominal cavity is more important in determining risk than the amount of fat under the skin but outside of the cavity. This latter determination requires sophisticated testing not generally done in clinical settings. Men have a higher waist:hip ratio, and a higher risk of complications of obesity. Another concept worth considering is "percent body fat", which is similar to "lean body weight". These can be derived from standard equations, or made more specific by measuring the thickness of the skin at specific locations (they don't cut the skin and measure it . . . the skin can be folded and measured with calipers!). The risk of being overweight is less in adults over 65 years of age. Indeed, being too skinny is an important risk in many elderly people. Under nutrition is not to be ignored. There's no easy answer for this relatively simple and apparently obvious question. Weight gain obviously ensues when the number of calories taken in exceeds those that are burned off. The amount of calories taken in excess of those burned turns out in many cases to be pretty slight. In fact, the average American gains about 20 pounds between the ages of 25 and 55. This represents calories taken in excess of those burned in the amount of 0.3 % (yes, less than 1 percent)! This is certainly an irritating thing . . . but on the other side of the coin is the fact that very small decreases and increases in expenditure can lead to considerable weight loss over time. There are some medical causes of overweight noted in one of the next sections. The vast, vast amount of obesity seen is not due to disease processes, but the simple imbalance of supply and demand. The tendency towards obesity is built into our genetic code, and for a good reason. The ability to save calories in times of high food availability is an excellent idea in an environment where food sources are not always easily available, exactly the sort of environment humans evolved in. This would explain why we are able to store this extra fat in the first place. However, in our highly successful culture, where high caloric foods are easily available all of the time and activity is often optional, this genetic tendency can cause a great deal of harm. The genetic tendency to obesity can be demonstrated in many ways. Twins who are raised apart from each other may have very different diets, but often have remarkably similar weights. Children born to obese parents eat more and gain weight more quickly. However, these genetic tendencies are influenced by our behavior. We receive a tendency, not an absolute determinant, of our weight from our parents. Complex interactions within parts of the brain not under our conscious control can control our eating behavior to seek and store calories. There is a tendency of the organism to decrease the amount of energy utilized during periods of caloric deprivation, and mechanisms that improve the ability to store fat. Those of us who have dieted always suspected it was harder than it should be. This is indeed the case. At the time of this writing, while we understand the importance of genetics to the development of obesity, the specific genes involved have not been identified. "Leptin" and "leptin receptor" are hormones found in both mice and humans. While weight can be manipulated in laboratory mice, the effects in humans are far less predictable. There have been specific genetic abnormalities identified in some rare forms of human obesity, but none yet that delineate the mechanisms and treatment of obesity in the population at large. Even though there are tantalizing promises of beginning to manipulate our weight using genetics, we do not yet have that ability. It may be many years until we do. We are left primarily with the means at our disposal . . . control of the number of calories ingested and the number of calories burned. Wait, and pay attention here. This is one of the main reasons people "fail" in weight loss attempts . . . frustration and hopelessness from unrealistic expectations. It is important to have realistic goals. You can lose some weight. It can make a difference . . . and maybe a big difference in your health. And you are not a failure if you don't reach some "ideal" or "dream" body weight. You're a success when you improve your health! Yes, a few, but they are not very common. There may be abnormalities of the thyroid or adrenal glands, or of the ovaries. There are rare genetic abnormalities which are quite distinctive and even rarer. Rarely, tumors are associated with weight gain. These conditions are difficult to diagnose, and are a good reason to be evaluated by a physician for weight gain and the potential programs for weight loss. First, let's set some realistic goals. If you're gaining weight, stop this. Even if you're only 10-20 pounds up, if you're gaining, you're headed in the wrong direction. If you're substantially overweight, start by aiming for a 10-15% reduction . . . and holding it. This will begin to benefit your health substantially. A weight loss goal of 1-1.5 pounds weekly is realistic, and allows for adequate nutrition. Add it up . . . that's 50-75 pounds a year. You may very well be able to lower your blood pressure, sugar and cholesterol levels, and indeed decrease your medications (under your physician's guidance). Learn how to eat. See the sections on HeartPoint regarding reading nutrition labels, figuring your caloric requirements, and eating at restaurants. Avoid claims that sound too good to be true . . . they are. "Miraculous", "effortless" and similar adjectives are a big tip-off. Let's save some time, trouble and money and avoid these! Obesity is a chronic condition. You will need to pay attention to your food intake for the rest of your life. One of the more reproducible findings in medicine is the tendency towards regaining weight after an intervention aimed at weight loss. That is, most people land up right where they were one year after the weight loss intervention whether it be diet only, medications, etc. This is more obvious the shorter the intervention. The other way of saying this is: Fad diets do not work! The different types of diets do not have any particular "magic" to them. They all work only if and only if the intake of calories is less than the energy a person uses. Some diets may show a bit more prompt weight loss after beginning, but this is due to a somewhat artificial loss because of fluid loss. Controlled studies show the same amount of long term loss when the number of calories are kept constant regardless of whether they come from fat, carbohydrate, or protein. It is very important to note that the chances of long-term, significant, and health-improving weight loss programs and individuals almost invariably incorporate an exercise program into their plan. How about low fat diets? These are the diets with the longest track record, and with the known ability to prolong life. They continue to be recommended by the major medical groups in this country. Diets stressing balanced low fat such as the American Heart Association (there is a large section on this diet on Heartpoint: link) or low simple sugars (such as the American Diabetes Association) have been proven to be of benefit. There are others who argue that these diets, which many find difficult to follow, are not enough. They point to the successes obtained with ultra low-fat diets, and argue that fats should be cut to 10% of calories to achieve reduction of diseases such as coronary artery disease. Major promoters of these diets include Dr. Dean Ornish and another by Dr. Hans Diehl (the CHIPS, or Coronary Health Improvement Program). There are other "flavors" as well. These do appear to work and may be a good alternative for many, although the change from the average American diet is quite marked. These programs are successful however, and also provide for substantial physician and group support in the endeavor. What about those "high protein" diets? Talk about popular! There are several varieties of this diet: Protein Power, Mayo diet, "Zone" diet, Atkins diet, Scarsdale diet, etc. Most promise, and deliver, a fair amount of weight loss which can be very pronounced at the beginning of the diet. Proponents of these diets note that the low fat diets promoted by the AHA and other health organizations replace the fat in diets with carbohydrates. This increase in carbohydrate intake can lead to problems with the handling of sugars, "rebound eating" from fluctuations in insulin levels, and worsening of some metabolic parameters in some patients. Indeed, in some cases, cholesterol and/or triglyceride levels can become worse with ultra low fat diets. Another important observation is that while the average fat consumption in the country has decreased, we have seen a continued increase in the average body weight and incidence of obesity. This may be secondary to the increase in carbohydrates. Opponents of the protein diets point out that much of the weight loss occurs early and is due to the enhanced loss of sodium and water as opposed to true weight loss. They point out that almost all populations studied show an increase in heart disease mortality with the levels of fat intake proposed in these protein diets. They are also generally low in fiber, which is important in other aspects of health. It's a classic problem for the public at large. Who to believe? These diets have been used by millions of people with success. My own personal bias is that protein diets can be good for some people, particularly as an initial program for losing weight. They have not yet stood the tests of time compared with their competitors. They seem to be particularly helpful in allowing some people to find a diet that works and is palatable to them. They do seem to stress and accomplish control of eating behaviors better than diets which feature low fat and higher carbohydrate intake. I would urge most people to wean themselves off this diet for the long term if possible. Consider the Mediterranean diet below. These are typically low in fat and high in carbohydrate. They also have a high fiber content. The foods involved are typically less "dense" in terms of their calories. Care must be taken to provide enough protein and vitamin B12 in "total vegan" diets, but are less problematic in vegetarian diets which allow dairy and/or egg products. These diets are to be encouraged, but are certainly not popular at this time. What is the "Mediterranean Diet"? As scientists studied the typical diets of populations throughout the world earlier this century, they noted that the populations with the lowest intake of fat seemed to have the lowest incidence of heart disease. However, one area of the world where this didn't seem to hold true was in the Mediterranean area. The "Mediterranean diet" was informally practiced by people in this region, and was notable for a relatively high proportion of calories as fat (35% as opposed to the AHA recommended 30% and the average American 40%). Saturated fat intake is relatively low at 10%, but there is an increase in the amount of monounsaturated fats, such as those found in olive oil. High amounts of "omega-3" fatty acids are also present. This diet is a fairly balanced one in terms of carbohydrates and protein. It stresses complex carbohydrates, is high in fiber, and uses fish as an important source of protein. There appear to be health benefits above and beyond the caloric quantities and qualities that may relate to an improvement induced by certain fat substances that cut down on the body's tendency towards oxidation, and stabilization of cell membranes which can lead to a decrease in sudden death. There are also a variety of these. They require administration by medical professionals, as they can be associated with significant risks. Dieters take in only preformulated, generally liquid food preparations providing about 400-800 calories daily along with 2-3 quarts of calorie-free beverages. These very-low-calorie-diets ("VLCD's") high blood pressure, diabetes, and cholesterol levels. Their effectiveness comes at a price, literally. They are quite costly. There may be an increase in gallstones with these diets, as well as the potential for other metabolic abnormalities. Do not try them without supervision! Realize that while these may work well, part of the reason is that the person "is removed from the food environment". This stresses the importance of feeding behavior in developing and maintaining obesity. A long-term maintenance plan for when people begin to eat again is vital to long-term success of these programs. To some degree, yes. But you may want to take a hint from the prepared very-low-calorie-diets noted above and find some pre-prepared foods to use. There are breakfast beverages, breakfast bars, controlled calorie frozen prepared meals, etc. You can use these for two of your meals each day. You'll then know what you can eat for dinner, and you'll only have to "figure out" one meal. You can even do this for all three meals if you want, as long as you get adequate nutrition. Can I eat more if I exercise? Exercise is a tricky business with weight loss. It really doesn't help much if you exercise but don't diet. Worse yet, in the short term, weight loss is generally not enhanced. However, it has been shown time after time that long-term weight loss with a diet is greatly enhanced with regular exercise. Interestingly, although the amount of weight loss is not different with the addition of exercise, more abdominal fat is lost. "Fat weight", the dangerous sort of weight, is replaced by more healthy and heavier muscle. Exercise is generally recommended to include 20-30 minutes daily 5-7 times per week. If you figure that this will increase the amount of energy you burn by about 700-1000 calories per week in most cases. Since we have to burn 3500 calories to lose one pound, the net effect of exercise alone in weight loss is that you'll lose about an extra pound every 5 weeks. Despite the mathematics here, exercise should be included in almost everyone's weight loss plan, particularly their long-term maintenance program. Your survival may be enhanced as much by the exercise as it is from the weight loss. Putting both together should be additive. You should be evaluated by a physician prior to beginning an exercise program. Men over the age of 40 and women over the age of 50 may be appropriate candidates for a treadmill test. Be aware that stresses, strains and joint injuries can occur with exercise. Begin your program wisely . . . don't "push it" if you're hurting . . . and keep up a successful program long-term. Indeed there are. George A Bray, MD has published a very nice compilation of behavioral techniques in the electronic textbook UpToDate (this is a wonderful medical text published in electronic form available 800-998-6374 or www.uptodateinc.com). These are very valuable techniques that you should try. Don't put serving plates on the table. Put utensils down between bites. Take a drink of water between bites. Shop at the market shortly after eating. Choose a plan (see next section) with an established group to help. Really work on saying "no" to people encouraging you to eat. They may be trying to be kind, and/or subtly undermining you. Either way, work on repeating "no". A buddy or formal weight loss program can be really helpful with this if it's a particular difficulty for you. Be nice to yourself if you fail a little. Don't give up on yourself as a failure for a mistake. Figure out how to get back on track. Don't go to an event hungry . . . eat a salad or some fruit before going. Watch your intake of alcohol . . . many don't realize this is a high-calorie "food". Avoid high calorie condiments such as ketchup, mayonnaise, barbecue sauce, etc. Don't wait for an event such as New Year's Eve to start your program! There are several national programs which can be useful resources. Some are free, some are for-profit ventures, and some are more like co-ops. Other local resources may be available. If you think you have a useful addition to this list, please let us know. Registration about $20, $10-$14 per week. Remember what we said earlier: Weight gain follows weight loss. Perhaps nowhere was this more true than with the more successful diet pills such as Redux and Fen-phen. Virtually all of the weight that was lost was regained within 7 months of discontinuing the pills. There are risks to diet pills, risks that are certainly legitimate to take if long-term weight loss results since weight loss generally leads to a marked reduction in many health risks. However, weight loss must be sustained to reap the rewards. It has been suggested that some of these preparations have been advocated not as an initial approach, but rather to be utilized in some people when a "plateau" of weight loss is reached. Redux and fenfluramine (fenfluramine was the "fen" in "fen-phen") were removed from the market. They were associated with an increase in the incidence of pulmonary hypertension, and there was an increased frequency of specific valvular abnormalities found. They were "anorectic drugs" designed to decrease the sensation of hunger by decreasing the reuptake of a chemical called "serotonin" in the brain. Phentermine and similar agents (phentermine was the "phen" in "fen-phen") are still available and still used. They work by increasing the amount of a chemical transmitter in the brain called "norepinephrine". Meridia (sibutramine) is a medication currently available as an aid in weight loss. This medication stimulates the sympathetic nervous system, reducing food intake and increasing metabolism to some degree. It does increase blood pressure and pulse rate, and is generally viewed with some suspicion by cardiologists due to these effects. The manufacturer recommends that people with poorly controlled hypertension, coronary artery disease, congestive heart failure, arrhythmias, or strokes not take this medicine. Other contraindications include severe liver or kidney disease, history of anorexia nervosa, seizures, pregnancy and taking certain other medications. Again, questions of long-term effectiveness must always be asked. Knoll Pharmaceuticals maintains a very good web site at www.meridia.com. Orlistat is a compound which decreases the absorption of fat from the gastrointestinal tract by inhibiting an enzyme important in its breakdown and absorption (lipase) within the GI tract. Some of the fat which is ingested passes through without being absorbed. It is important to note that orlistat is associated with diarrhea and increased intestinal gas due to these actions. People quickly learn to avoid high fat diets (greater than 30% of calories as fat) since the higher the fat content of the meal, the more marked the side-effects. Orlistat has been shown to show a continued enhancement of weight loss compared to placebo pill -- however, the question must be is it enough weight loss to be important? In a two year study funded by the manufacturers (this would indicate probably a "best case scenario" better than one would usually achieve in the real world), patients on orlistat lost more weight in the first year (approximately 20 versus 13 pounds) and regained less in the second year (about 7 versus 11 pounds). The net improvement in weight loss was therefore 11 pounds taking a pretty expensive medicine 3 times a day for two years. 11 pounds may not be a tremendous amount of weight for many people. Notably, almost 55% of the group did not complete the study for a variety of reasons. My personal conclusion at this point is that orlistat may work for some, but is not a promising agent for inducing enough sustained weight loss in most individuals to make improvements in their overall health status. Over-the-counter, alternative, herbal and complementary preparations are available which are offered as aids to weight loss. There are a variety of theories offered for various preparations. 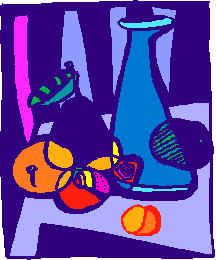 The most common are stimulant-type drugs which induce a feeling of being full, or at least not being hungry. Ephedrine is one such drug (link to complementary). They are to be avoided particularly in people with heart disease in whom such stimulants can be dangerous. Others are "natural fen-phen", which if they indeed work as did the synthetic but "real fen-phen" would be anticipated to have the same potential for serious side effects. I am not aware of any evidence that the numerous combination diet preparations have been proven to work, or to overcome the tendency for regaining lost weight. Several surgeries have been developed to try to help with obesity. Some procedures can be successful and indeed are a long-term solution to a long-term problem. They are associated with some risk. They are reserved for those with severe obesity (BMI>40 or >35 with significant co-existing health conditions related to their obesity). There are several procedures performed on the stomach. "Stomach stapling" (gastric reduction) surgery may be performed with or without a bypass of part of the intestinal tract. These procedures work because of several factors, not all of which are well understood. The sense of fullness is reached earlier in the smaller stomach, and the "dumping" of stomach contents into the intestine may also decrease the urge to eat. There are risks of obstruction of the smaller stomach, as well as electrolyte disturbances, inadequate absorption of some nutrients, formation of gallstones, and others. The procedures can be successful, however. 80% of patients remain at least 10% below preoperative weight 10 years after the procedure. Intestinal bypasses are performed far less frequently today. The results are about the same as with the gastric procedures, but side effects are generally more marked. Obesity is common. It is downright dangerous. It is not a matter of vanity. It is a chronic problem, and long-term solutions are required. Realistic goals include reachable weight loss which result in significant health gains. A sustained 10% loss in body weight is a reasonable place to start. Pills for weight loss are not the whole answer. Prescription diet pills have been demonstrated to be temporary in many cases, and are not indicated for many because of substantial side effects. They may be useful as a part of the solution -- it is a reasonable to discuss this with your physician. In most cases, over-the-counter and herbal remedies are particularly ineffective and possibly dangerous in the areas to do with weight loss. Small changes are additive . . . cut down 50 calories, walk 15 minutes a day while keeping other things constant can lead to a 10 pound weight loss over 1 year. There are behaviors which we can develop which will help with weight loss. Incorporate these too. If you quit smoking, you may indeed gain more weight. However, you should quit smoking first in almost all cases. All things considered, smoking is much more dangerous. Clinical Guidelines on the Identification, Evaluation and Treatment of Overweight and Obesity in Adults. Archives of Internal Medicine. 1998;158:1855-1867. Krauss RM and Winston M. Obesity, Impact on Cardiovascular Disease. Circulation. 1998;98:1472-1476.